Olivia and Madelyne Meylor are in their early 20s. They still want the world to know what happened to them as teens after they received three Gardasil shots – an HPV vaccine marketed as a way to prevent cervical cancer. Diagnoses of Premature or Primary Ovarian Failure (POF) followed leaving only 5 percent chance one of them could ever get pregnant. In this story about a pending federal court case they were involved in last year, they reported that not only did their ovaries stop producing eggs, but they also have insomnia, night sweats and headaches. They say they can not get pregnant, but might be able to carry a baby. As teenagers, it would appear that they both entered into full-blown menopause. Coincidence? Genetic predisposition tests ruled out genetics for the disorder which is rare in teenagers. Their mother says all roads lead back to the fateful shots in 2007. You can see from the local news report that Merck denies any correlation to the vaccine, upholds the results in its clinical trials, and claims that similar adverse were found in placebo studies. 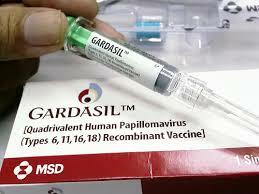 Yet, this study in 2013 shows that POF does indeed follow Gardasil shots, and stems from adjuvants in the vaccine causing the body to attack the reproductive system, as well as cause cognitive and psychiatric disturbances. Imagine if a toy or candy created tens of thousands of adverse health reports and over a hundred deaths? Would there not be some kind of outcry or intervention? It’s interesting that legal scrutiny is aimed at energy drink manufacturers, but not for injections given out by doctors. Could that be because the U.S. Government receives royalties on Merck’s Gardasil sales? The NIHdoes not wish to reveal those figures. In the report on the pending court case last year, the government would be defending Merck, arguing that the POF was not related in any way to the vaccine. However, Dr. Yehuda Shoenfeld, from Israel, planned to testify that their disease was autoimmune and brought on by the adjuvant substances. That is, Autoimmune Syndrome Induced by Adjuvants, or ASIA.